A week or so ago, we did a little walk-through of my newly updated office...today I thought I'd go around and show you where things came from to show you that amazing style doesn't have to cost a TON of money! Note: we shopped my house when redoing this room...VERY little is newly purchased! I encourage you to shop your house before buying new things. We have so much that can be used in fresh ways, right?! 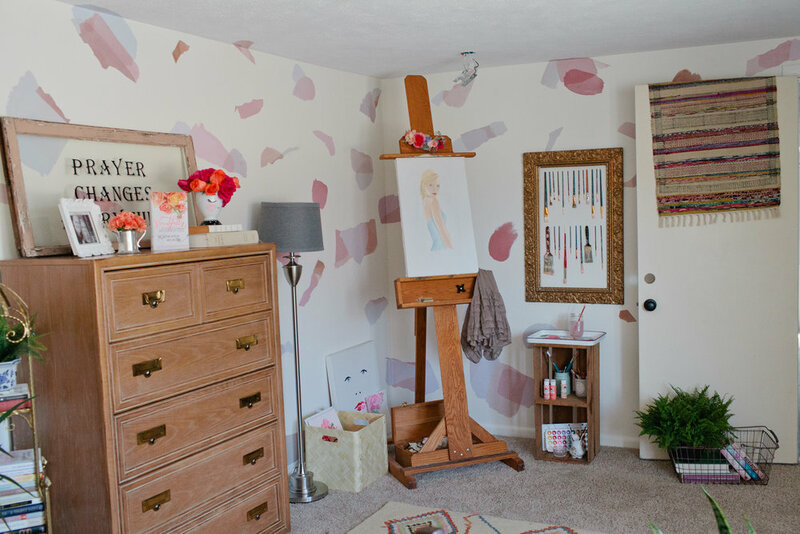 If you need a reminder of how the room looked before my friend Leah (from The Light Filled Home) worked her magic, head over here. Are you a fan of Goodwill? 'Cuz I sure am...it's such a treasure-trove of fun! Did you know you can be a member and get things for even cheaper? Anyway, with my "member discount" I got this chair for $.99 when they were doing a big sale. I'd had it by our fireplace and was most recently in Laith's room because he wanted a cozy place to read near his bookcase. We switched out my old chair with this one (so my little bookworm still had a place to read) and it was a win-win! I wanted loads of plants everywhere and when you enter the room, there are several right at your feet. 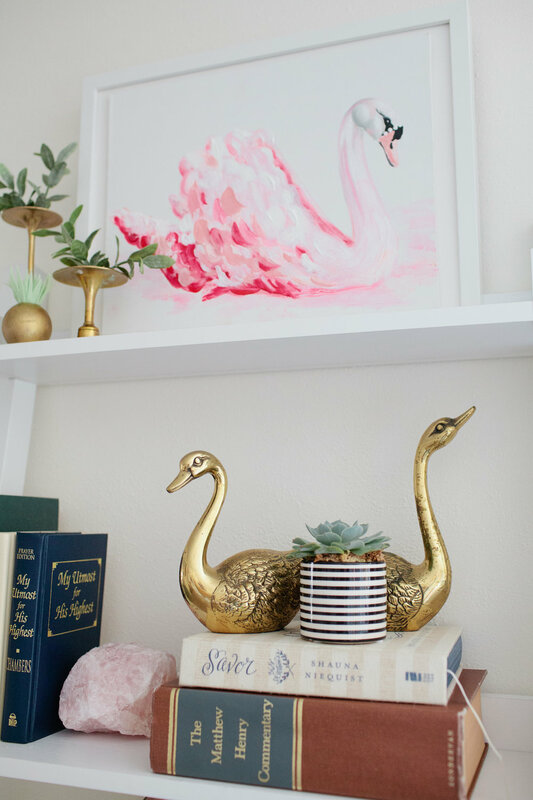 We used this fun gold plant stand that I've used as a bookshelf for the past decade and mixed in both real and faux plants. We had tried a real one here but when I watered it, it drenched all my books (I nearly cried) so it was replaced with the faux one so I wouldn't ruin any more books. PS see my book on the stack?! Eeeeeeeee! Happy dance! Go order it here!! The plant baskets in the office are from all over. The grey and white one above is actually a trash can I found at HomeGoods. The woven one is from Ikea. I've seen this light allllll over instagram and have been completely obsessed. I told my friend Leah (who was helping me with the room), that we had to somehow work it into the design. Because one can never have too many flowers, I connected these pretty crepe paper ones from Amaranthus and I'm just over the moon about it! As you can see, my light isn't even connected yet (eye roll), haha. But when this baby has light, she's gonna be perfection. Our little neighborhood has a Facebook Garage Sale page and I snagged this cute little crate from it a year or so ago for $3.00. It's been in our Upper Room (aka TV room above the garage) but is even better here, holding paints and brushes. When this family devastation was brand new, Leah (my interior designer friend) and my best friend Kiesha dropped the loveliest care package at my front door. The gift was held in this fantastic vintage wire basket and I knew I had to use it for something fun. Another plant and more books makes the perfect little vignette. More books and more plants are seen on these leaning bookshelves (similar one found here) and I'm in absolute love how Leah styled them. This tiny gold + brass colander was in the clearance section at Anthropologie ages ago (similar one here). I had washi tape resting inside, but I love this even more! The faux plant is from Ikea (similar one here). More faux plants (from Ikea) and fun little details snagged from around the house! 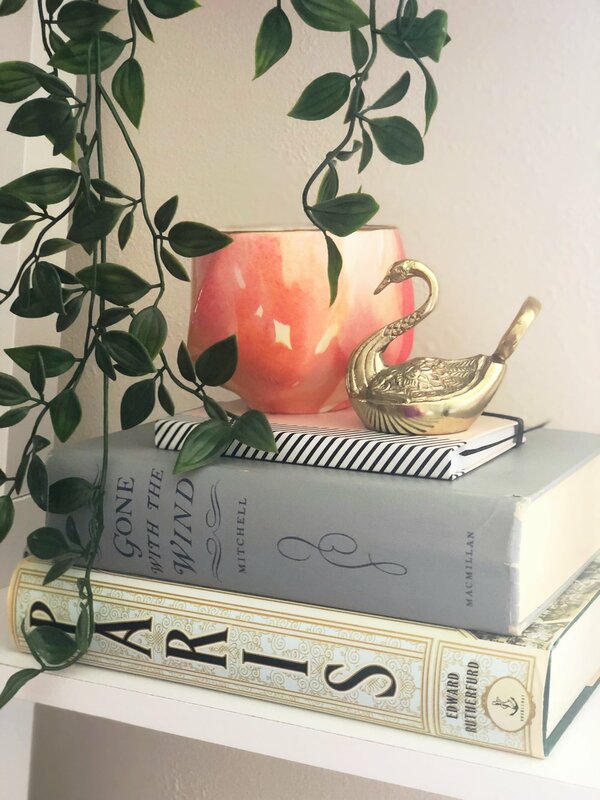 Both the candle and swan bottle opener are from Anthropologie's clearance section (these pretty details were purchased long ago...sorry I don't have links, but somewhat similar candle here). Another fun Anthropologie find is this teacup! A friend gave me several and I love having a little succulent inside! Darling, right?! Here and here are similar designs! I used to have fun vintage and Anthro-inspired plates displayed all over the house. Sadly though, through our (many!!) moves, most have broken. So now I have plate holders without any plates, haha. Leah had the brilliant idea to put my Abide sign on one. I just love it here! It was a gift from some ladies I spoke at a retreat with, so sorry I don't have a link. I love when things are used in an unconventional way. See those brass candlesticks (from Goodwill) up top, left? They've been turned upside down and now hold sprigs from a plant. So fun. Heading over to the Studio area of my office, I just want to smile. Sighhhhh...I'm so exited to have started painting again. And those watercolor decals (!!!!!!!) aren't they just SO FUN?! Head over to Urban Walls for all their styles. These decals, the woven pendant above my desk, and some plants are really the only things that are new. Everything else was shopped from around the house! That dresser? $20 at Goodwill. The lamp is about 20 years old, crazily enough, and is handed down from my mom when they moved (the shade is Target). The big gold frame is from a garage sale (about 15 years ago). We needed a pop of color and texture, so Leah hung this fun rug hanging over the door is from World Market (these are similar). It had previously been in the Upper Room, atop a side table. An old (broken) frame from Hobby Lobby and a cream pitcher from Goodwill filled with carnations, adds whimsy to the top of the dresser that I use to hide gift wrap, paper, and odds-and-ends. 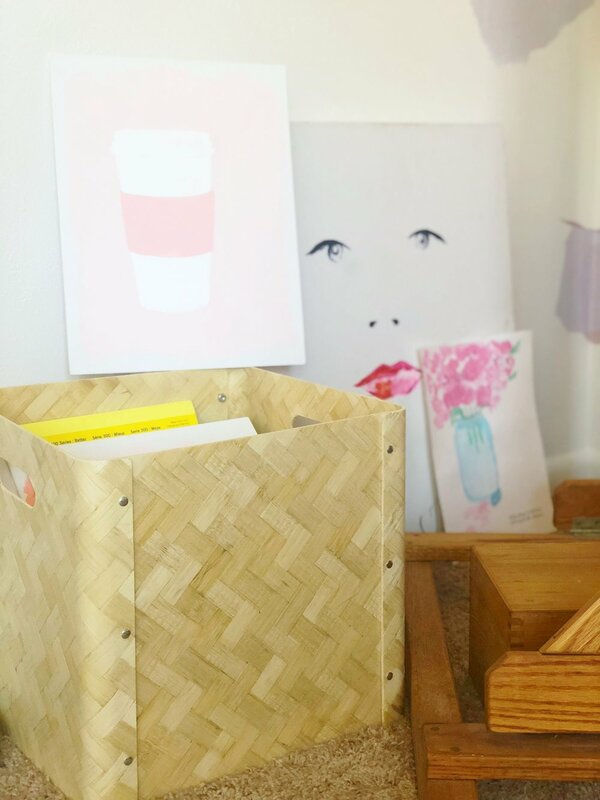 This great bin is from Ikea and is the perfect place to hold canvases and watercolor paper. it's surprisingly rigid and strong, though the woven texture makes it feel a bit breezy. I am so head-over-heels for these air plants!! I found the glass globes in Target's Dollar Section last year but the rocks and air plants are available there right now (near the seeds + summer furniture)! Aren't they so cute hanging in the window? So simple and pretty. Btw, this is the backside of my desk. I love how there is space for the kids to sit and face me. Because it's set up this way, little Elsabet sat in the mound of pillows and was able to paint while I worked at my computer the other day. The pillows in the window are from all over and none are new so sorry I don't have links to share. But they're all from Target, Ikea, and HomeGoods! I loved having her so close while I worked...though she totally made such a mess. Eek. More stuff on my desk that makes me smile. I love that Leah used my old (still messy!!) paint palate for beneath my pens and such. So creative!! And this pretty glass pitcher is also from Goodwill...or was it a garage sale...?? I love the easel that holds our family portrait from this shop (similar easel here, though I've seen mine at Walmart lately). That gorgeous paper flower is from Katya Paperie. I'm a total book nerd. This collection of Bibles is a perfect base for this little vignette. The coral one is actually the box my She Reads Truth Bible came in. So though my actual Bible is downstairs where I do my morning devotions, this pretty box stays up here! I'm also a bit obsessed with my calendar from Lindsay Letters. Y'all...it's amazing. You need one. They come in all sorts of sizes and frames. Check them out!!! My desk, file cabinet, and trash can are all from Ikea...I've had the desk and cabinet for years and am still so in love with it! This brightly colored rug used to be in another room, too. I purchased it years ago during RugsUSA's 85% off sale. This is totally not sponsored by them...I'm just telling you as a public service announcement...go get on their mailing list. This rug was originally $1,500 and I got it for $450 + free shipping (that's even more than 85% off!!!). Your floors can thank me later. Am I missing anything? Are there any items you'd like to find out where I found? Let me know!! Never having lived in a neighborhood where we’ve actually known our neighbors, we wanted to change that. Our family decided we wanted to live life with those in our community, rather than drive into our garage and put the door down behind us, shutting out any chance of getting to know anyone. Three cross country moves and various neighborhood and city changes means we’re now in our seventh house in ten years of marriage. Finally though, with tons of transition tucked into our belts, we’re itching to settle and grow roots…but that’s something that needs to be done both organically and with intentionality. Deciding we simply wanted to open our doors, we begun just inviting people in. My first Book Club gathering was two weeks after moving into this house and we laughed and chatted amidst boxes that surrounded our living room. No one cared one bit. Last summer, we had dinners in our backyard, calling each one “An Evening to Nourish”. Faith, age, and station in life didn’t matter at these evenings. I didn’t seek to combine a group of like-minded ladies, but rather went out of my little bubble and welcomed in women I both knew well and really wanted to know well. Most of the time, I sat around our table with women who had never met one another…but they certainly knew each other by the end of the evening. Phone numbers and hugs were exchanged at the end of each Nourish event. We felt nourished. Not only because our bellies were full, but because our hearts were. Lately, the desire to be more intentional about inviting families into our home has been on our hearts and decided doing Outdoor Movie Nights would be a great way to begin. We’ve hosted tons of them these past few months (so many in fact, that we decided to make a quick diy screen rather than hanging a sheet on the fence)! 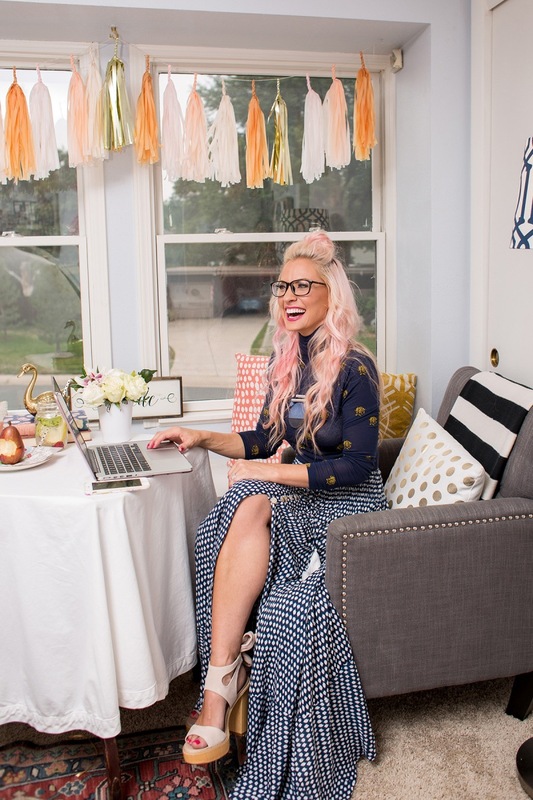 I think we've been able to host so many though, because we decided that although we’re big fans of going all out for parties and events, something quick, simple and manageable needed to be reality. I needed to remind myself that if I made a big deal out of planning, it wouldn’t end up happening very often. The whole point was to get to know our community…not throw the bash of the century. Not wanting to spend more than a handful of dollars on these evenings, I decided to reuse wooden pallets I’d accumulated for a big picnic we’d hosted this summer. Spreading them out around the backyard, we covered them with blankets or tablecloths or even a few yards of fabric I’d found a few years ago at Goodwill. I just used what I had. Knowing evenings are beginning to get chilly now that fall is on it’s way, I also put out extra blankets to wrap ourselves in (These grey fleece ones are from Ikea and cost $3.99 each). Since we wanted as little prep as possible, we decided to forego using our microwave, and simply bought a big bag of pre-popped popcorn at the grocery store and poured it into brown paper lunch sacks. I didn’t have enough to fill every bag to the top, so I cut the bags down a bit…which was probably good anyway because most nights I end up throwing out a dozen half-eaten sacks anyway. I love tossing fruit into a big pitcher or jar of water rather than serving kids soda because well…kids and soda equal insanity. They never seem to mind and it’s easier on my pocketbook anyway. Depending on our crowd, we usually put out some adult beverages too. Doing as much beforehand as we can makes having people over even more manageable. I often make my favorite slushy cocktail and slide them into the freezer a few days beforehand and shop our house for pillows and blankets, folding them into a pile the day before, so we don’t need to scurry around the house making sure we didn’t forget anything. Target, Ikea, and Goodwill are my go-to stores if I end up feeling we need anything, but I’m generally a huge advocate in using what we have. 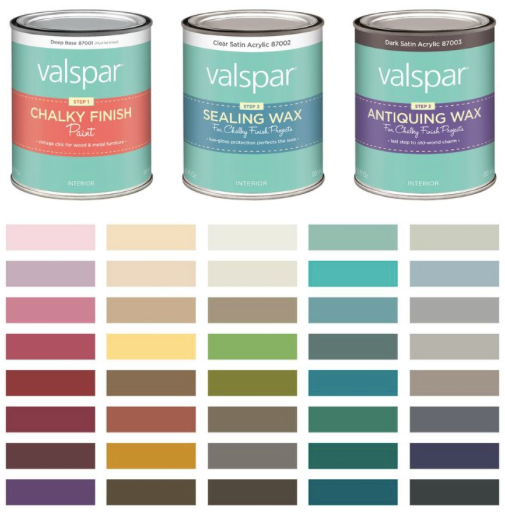 Shop your house!! Don’t put out anything fancy that can’t be washed…remember, people are going to be eating and drinking while lounging on these things. Have a blanket with stains? Who cares, it’s going to have greasy popcorn spilled on it anyway. The goal is for people to feel comfortable, that they can unwind. Being present in your home should be a breath of fresh air to their soul. Let them feel Jesus when around you. It’s not about everything matching. It’s not about throwing a Pinterest-worthy event. This is about hospitality being an avenue to minister to our community without them feeling we’re shoving Jesus down their throats. Your home doesn’t need to be perfect. Your yard doesn’t need to be pristine. You may live in a rental or something you feel is too tiny to entertain well. But you know what? No one feels comfortable in so-called perfection anyway. Let the love of God shine through us all as you open your homes to your neighborhood. Because you might be the closest thing to Jesus they’ve ever met.